The lead character is boringly cynical, stewing too much in self-pity. ‘God Bless America’ is a preachy, irritating film that ultimately failed to resonate with me. I regularly shared the sentiment of the film’s protagonist, I too hate the culture the film attacks, but he’s so tiringly cynical and grumpy that he loses pathos and becomes difficult to relate to. 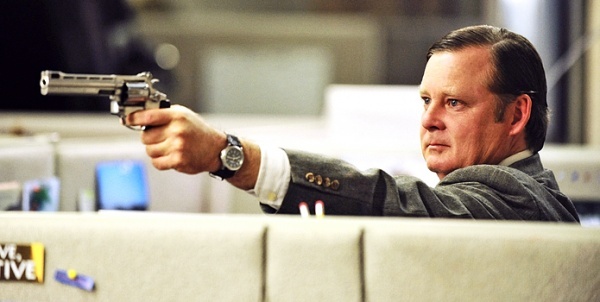 Though he is articulate, Frank (Joel Murray) started to remind me of the generalising fools with chips on their shoulders who smugly moan on and on about standards of education and the justice system as if they know what they’re talking about. While Frank was generally far more correct than people of this ilk, his unadulterated negativity meant that partial comparison became unavoidable. So almost immediately, there was a big problem, but then it got worse, the film’s credibility sank upon the arrival of Roxy (Tara Lynee Barr), Frank’s annoying little side-kick. Their ensuing double act killed it – it’s just fantastical and silly. Though the film taps into your pet hates and everyday annoyances, its lack of reality means that it isn’t half as effective as ‘Falling Down’, which while it is rather manipulative manages to resonate through being funny, tragic, satiating and for the most part, realistic. It is Roxy that places ‘God Save America’ alongside the awful pseudo-superhero film ‘Super’, but thankfully Tara Lynne Barr’s acting isn’t as unbearably irritating as Ellen Page’s. There’s also a moment that copies the gun salesman scene in ‘Taxi Driver’ almost verbatim, something that I found more of an offence than some sort of homage. A merit would be that some of the slayings are indeed quite funny in their brutality, especially one concerning a vile creature from those awful ‘Super Sweet 16’ programmes. Ultimately, the film unfortunately loses the steam it mustered in its opening.